Disclaimer - the prize has been purchased with my own money, I am not affiliated to this brand simply a loyal customer. If the winner does not contact me within 48 hours of me announcing a winner another will be selected. 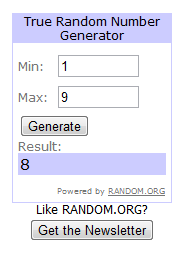 I had 9 entrants and I numbered you in order of comment left. Great giveaway! I should win as I'm really in to natural skincare all of a sudden, after noticing my Cetaphil cleanser contained 3 parabens! Now, I'm trying the Organic Surge cleanser, but naked is next on my list! I just saw your blog on my hellocotton dashboard and I'm going to search through it to try and find a paraben free moisturiser! Not only do I want to win this, if you saw me after a hard day at work you would soon realise i NEED to win this. I would love to win this as I am always on the hunt for a nice body wash that is fine for sensitive skin. I find that I have reactions to a lot of body products so would love to try this and see how my skin is with it. I would like to win because I'm beauty product greedy and you can never have enough lol! Awesome giveaway! Too bad I'm not in the UK though. I'd love to win as I have recently been trying to change to natural products as part of my beauty routine and haven't tried much of the Naked range. Ooh I adore citrus scents, sounds like a great pamper, without the nasties in. I'd love to win this - having recently chucked away everything I own and going chemical free all I have at the moment to wash with is soap. 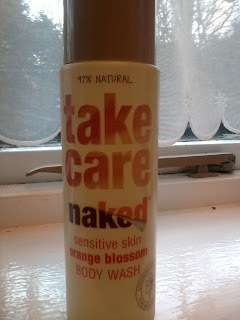 Tight-skin inducing soap *sobs* this body wash could save me from that!